The kind of place that makes you cut through an umbrella to get to your booze is always high on our list, which makes the relaxed kitsch of Hula's Modern Tiki a lounge that provides an enticing Phoenix evening experience. My favorite place in town!! amazing place to eat in Phoenix!!! the food here is amazing! The staff and bartenders are awesome! The atmosphere and the vibe are fun the restaurant is very clean and inviting. I definitely recommend this place for a great meal and a great tropical drink! Great food, good drinks, amazing ambience and good customer service!!! This is a fun place that never disapoints. The bergers are super duper! It&#039;s worth the effort to go here if you don&#039;t live downtown. The decor is fun and tiki like and there is plenty of outdoor seating in better weather. Just a fun place to meet and eat very well. In the heart of Phoenix' very gay Uptown District, across from Xavier Square sits Hula's Modern Tiki. You can't miss the hexagon shaped building riding by on light rail. Projected on the back wall of the restaurant are 1960's era beach ball flicks providing just the right ambiance. 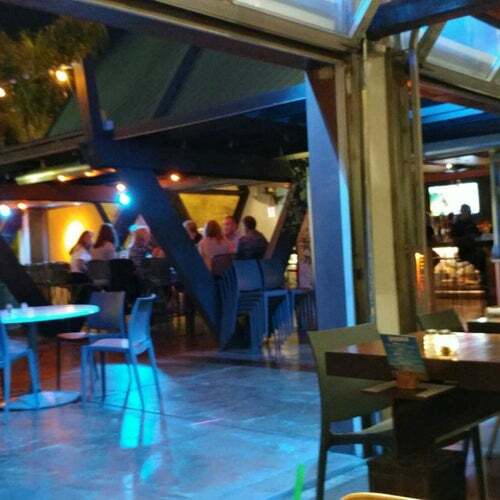 Sit indoor, at the bar for great Hawaiian beverages, or lounge outside for one of Phoenix' best street side experiences.